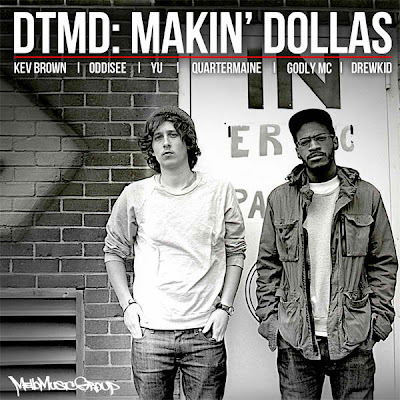 TMB-Music.com: DTMD - "Makin' Dollas"
Definitely getting this album. Check out this free track and let us know what you think. The News:DTMD (Dunc & Toine Makin' Dollas) has officially released their debut album! To celebrate the exclusive early itunes release, DTMD is giving away the title track "Makin' Dollas". The new album features DMV representers Kev Brown, Oddisee, Drew Kid, yU, Quartermaine, and Godly MC. The title track, Makin' Dollas, kicks off with Toine announcing his intentions: "The syntax is stress relief, in other words, if we speaking candidly, I be spittin' for the sanity, not really for the vanity." This style of articulate, sharp wordplay infuses Dunc's production with the kind of wise, intelligent raps that make listeners hit rewind. The beat itself is a working man's boom bap replete with lush guitar and vinyl scratches. Dunc’s rich, full-bodied production serves as a natural backdrop to Toine’s technically astute rhymes, layered deep with smooth instrumentation evocative of such luminaries as J. Dilla, DJ Jazzy Jeff, and Pete Rock, each of whom shaped the classic hip hop sounds of Dunc’s childhood. Toine’s energy and bright delivery belie wisdom beyond his years, inspiring deep reflection as easily as sharp battle fare and complex rhyme schemes. Maintaining a close working relationship with PG neighbor Oddisee and assuming a strong presence in the collective atmosphere of the DMV’s hip hop scene, DTMD appeared separately on MMG’s “Helpless Dreamer” compilation, Toine rhyming on “Different Now” and Dunc producing Stik Figa’s “From the Top.” Now the debut album Makin' Dollas hits itunes for an early pre-release exclusive today September 20th! The CD release is next tuesday September 27th with a vinyl edition coming down the road.